How did you spend your three day weekend? As a style contributor for FabFitFun I just had to share these two uh-mazing contest they are currently hosting! FabFitFun is challenging all of their fab followers to be the best you in 2013. A new challenge is being posted everyday in the month of January that is designed to help you be your best self. You can enter each challenge by tweeting pictures that coordinate with each challenge to @FabFitFun with the hashtag #EASfit. The reader that completes the most challenges will win a seven day luxury cruise courtesy of Celebrity Cruises. You can also win daily prizes including fitness gear and luxe beauty products. My sister and I have been entering the challenges and I hope that you'll enter daily too! For more details click here! For all of you food lovers, FabFitFun has teamed up with Sargento to create a fabulous recipe contest. They're looking for your best cheese-centric recipes using Sargento Reduced Fat cheeses. Choose from shredded, sliced & snack varieties to create guilt-free, super satisfying cheesy dishes. The grand prize winner, chosen by Sargento judges, will win a $500 fitness apparel gift card. The grand prize winner and three category prize winners also will be selected to win a year’s worth of Sargento Reduced Fat cheese in the form of 52 Sargento coupons. To enter your cheesy bite click here! Don't forget to follow on Twitter and Instagram! How did I not see your blog sooner! Love love love it! Adorable look! Love the animal print scarf! Don't miss my Hologram Sequined Bomber jacket. Don't you think it's awesome? I like this outfit very much, you always look fantastic! love the jumper, I adore this color. you look amazing as usual! Love that outfit, your hair looks so beautiful and the sweater is pretty! OMG, you look AMAZING. Obsessed with this outfit. Hello dear, thank you for your amazing comment! I have been following you for about 3 months and I love your style! You always got something special in your looks and I love that! Anna, you look gorgeous. I love this combo. And the Fabfitfun contest sounds awesome. Thanks for the info. I want this outfit. You always have the best pairings. Love the shoes. Adore this look, hun. Unexpected, fun, and comfortable looking. Hot!!! I love the chunky sweater with the feminine and girly skirt!! Those rings are absolute treasures too! Great outfit! Perfect for chilly winter days! Love the flash of leopard! you look pretty ! love your skirt !! Very nice pics and outfit. Hair is very beautiful. Great day. 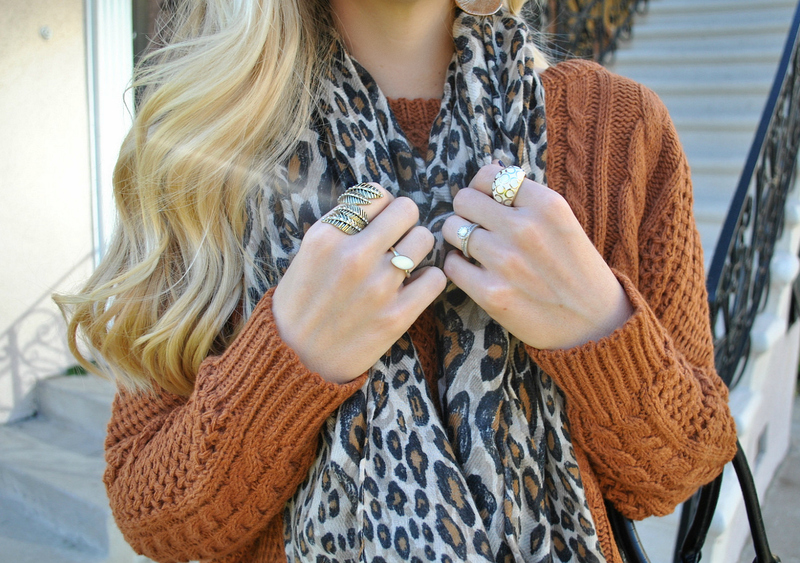 I love the caramel color of your wonderful sweater and it looks fabulous with the leopard scarf. Love that sweater! So warm and cozy! Orange is a great color on you - so pretty, and I love the gold jewelry! Oh that outfit is just perfect! I love the sweater skirt combo and the leopard scarf tops it off so well! Gorgeous look! Love the sweater! I took full advantage of the three day weekend, eating out, shopping and playing with my pretty new DSLR! up a correspondence extra approximately your post on AOL? my problem. May be that's you! Looking forward to peer you. Great look! I love the skirt and sweater! I really love how you styled this look! love the knit! I am in love with sweaters, the bigger the better. The knit looks so pretty!! Love it!! love how you styled this and the sweater looks so cozy! You look gorgeous, as always. Love the pop of animal print! This might be my favorite look of yours! I love a chunky knit... especially with a skirt or a pair of shorts. Hasn't this weather been so perfect?! This sweater is great and I love how you pair it w the scarf and the skirt! I love the cable knit and leopard! This is adorable. I've been wanting try this look. Love your blog and style. I love wearing chunky knits with a skirt!! I love that sweater - perfect for winter! Such a sweet comment you left on my blog! Thank you! Girly and cozy all at the same time...I adore it! Kate Spade is just classy! love this outfit :) you look great! Sweaters and skirts have been my go to look this Winter. I'm in Ohio and I currently have thick leggings under my skirt with boots, 2 shirts and a scarf because it's 4 degrees today. Yes 4! But, at least it's a cute look! I WISH WE HAD YOUR WEATHER UP HERE! I am dying for some sun and warmth! Lovely! Love the volume of the white skirt paired with the chunky knit! Love your sweater, cute and cozy. Hi dear, thanks a lot for your nice comment on my blog. Your blog and you are absolutely great and your hair is a dream. I like your blog very much and now I´m your newest folloer. Maybe you wanna follow me back? Oh my gosh, I love that sweater! I wish I could pair it with a skirt and bare legs, Im so jealous of your warm weather! I love how the sweater is layered over a skirt! Congratulations on being back in LA! I hope Maddox continues to do well. You look fabulous, and I look forward to the slew of Kate Spade. I really like your rings ! I don't really wear them that much but loved to !!! Your sweater looks so warm and cozy. Much needed here! Dying over this outfit. Chic/comfy. I agree! We need to have more 3 day weekends. Great look!I cannot wait to see your posts of your Kate Spade finds. Love the knit sweater! You look gorgeous. Love this outfit! The cozy sweater is perfect! Love your sweater an scarf! Can't wait to see what you bought! Gorgeous, Anna! Your make your style look so natural! You look stunning, Anna. I love this outfit. I just bought a skirt like that from Forever 21 and this is a great inspiration on how to style a structured skirt! Gorgeous outfit! Love that sweater and that scarf! love sweaters like that, so cozy! The burnt orange color is one of my FAVORITE shades to wear! The scarf and skirt that you put together with the sweater is just way too cute! I love everything about your outfit girlie. Chunky sweaters are a must.